A hackathon is an event typically lasting between 24 and 48 hours in which people come together to creatively solve problems. Although in many cases hackathons focus on developing and testing software prototypes, they do not always involve technology. Hackathons are unlike any other workshop. A hackathon is an exciting, energizing, intense competition-charged event that engages participants with customer-centric approaches to generate out-of- the-box ideas, while driving innovation and entrepreneurial thinking. Provide participants with the opportunity to learn something new while solving a clearly articulated challenge. Obtain valuable inputs from subject-matter experts from outside your organization. Apply problem-solving techniques in order to engage teams to crack the challenge. Accelerate your innovation process by harvesting numerous ideas in a short period of time. Collaboratively develop concepts and prototypes with a user-centric approach. Create new contacts from like-minded participants. This is the best way to reach out to and engage with the developer community and position yourself as a company that embraces technology. Identify talent to join your organization. 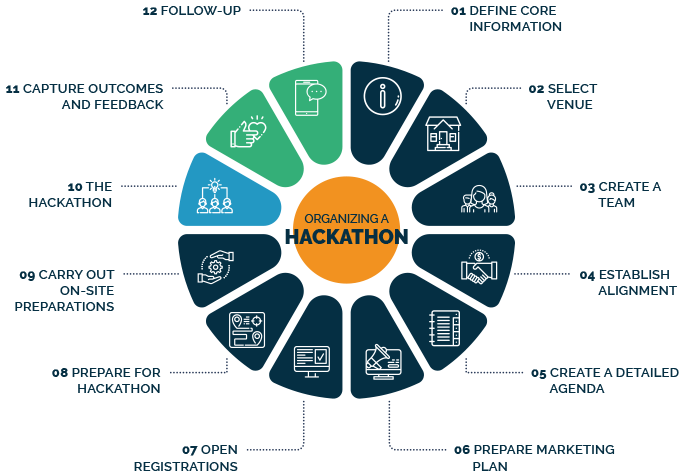 To ensure hackathon delivers value, helps change the innovation landscape and empowers participants and employees to act on the resulting ideas we defined a three-stage methodology that covers the pre-hackathon planning, the execution, and the post-hackathon stage. The Lean Analytics Association will work side by side with your team to envision, plan and execute hackathons. We work on themed hackathons and focus on solving specific problems or challenges by attracting subject-matter experts to join as either participants or facilitators. We rely on a proven three-step methodology that covers in detail the pre-hackathon planning, the execution and the post-hackathon phases. During the execution, we apply design thinking, ice breakers and engaging techniques in order to stimulate teams to generate creative ideas. We collaborate with a global network of facilitators and universities around the world, which allows us to organize hackathons in any location and in different languages, and, hence, target diverse crowds to join according to your needs. We make sure we articulate your challenge clearly to tap into the right participants through social media and different promotion channels. We guarantee your hackathon will receive the right visibility! A one or two-day hackathon may be what your organization needs to accelerate your innovation outcomes, motivate employees, attract new talent and find fresh ideas to solve the most complex challenges. The Lean Analytics Association will work side by side with your team to envision, plan your tailored hackathons. Have a look at one of the recent hackathons we organized and carried out for our global client in Cambridge, UK! How can hackathons fuel disruptive idea generation and accelerate innovation in my organization?